Before I make some comments on Ken Bruen's most recent novels, I want to thank those who've responded to some of my recent questions. You've reminded me of a couple of writers by whom I've only read one book--particularly Charlie Williams and David Peace. I can't remember why I stopped after the first Peace novel--I need to go back and have another look. Charlie Williams is a very dark and very funny writer, but his first novel was enough for me, for a while. Still, I'd highly recommend anyone who likes noir, crime, or black humor to run (don't walk) to get hold of something by Williams. 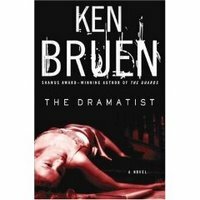 Now to Bruen--I'm going to make some comments about The Dramatist first, then come back and edit this post with some comments on Vixen (so last year! in terms of Bruen's output--there's another in this series due out this summer, Calibre). The Dramatist is the most recent of the Jack Taylor/Galway private eye books. Bruen churns these out according to not a formula but a sensibility or an atmosphere, carried forward (seemingly effortlessly and endlessly) by the author. Up to the end, I think the Dramatist is the best of the Taylor novels (and the next most recent, dealing with the famous Magdalen Martyrs, the worst). Taylor is less self-flagellating, sober, and honestly trying to connect with people. The plot (as always with Bruen) is really secondary--the results of his investigation come late and without much punch. The point of the books is travelling the hard road (the Calvary road, almost) of Taylor's journey through Galway and other Irish towns. But the ending to The Dramatist (don't worry, I won't give it away) ruins the whole thing for me. One reviewer at Amazon extols the ending for its sadness--in fact, there's a character who seems to exist in the novel only to die senselessly, and thereby send Jack careening off the water wagon and back into the bottle and his pal, despair. That senseless grasping for the maudlin effect makes me go back and re-evaluate the other characters and events--and in that re-evaluation I'm forced to regard all of the characters as mere props to provide Jack with a reason to fall back into the sewer where he was at the beginning of the series. I'm afraid I won't be able to follow his progress in and out of that sewer any more. The virtues of Bruen's writing are all still here--in particular his references to other noir writers, a gracious and helpful benchmark for his own writing--but have gotten a bit repetitive. And, as in some cases before, Bruen is writing so fast (and not getting the editing or fact-checking that he really needs) that he's not getting his facts right. In earlier books, he has misspelled the noir authors' names, and in these recent books he refers to Oz, the HBO show, as an "Australian prison drama." Oz is about Oswald State Prison, in the U.S.--and why is Bruen referring to it at all if he's that unfamiliar with it? And why is the editor/publisher not catching that kind of mistake? Bruen is endlessly creative, in the sense of generating lively text seemingly ad infinitum, but not so creative in the sense of giving the reader new experiences. Vixen has the typical Bruen virtue or limitation, depending on your point of view, of being a quick, brief read. And Vixen is part of what is to me Bruen's best series, ensemble-police-procedurals featuring a group of cops surrounding Brant, a hard man whose taste in fiction runs to Ed McBain, in homage to the inspiration for this series. But where McBain's 87th Precinct novels are at their heart humanistic, liberal, and sympathetic to the trials and tribulations of his cops and even the general public, Bruen's series is deeply cynical, sarcastic, and anti-humanist. Also a lot of fun--there's lots of wise-cracking and politically incorrect attitude on everyone's part. The plots meander around in the fashion of Elmore Leonard's best books--twisting and turning according to the characters inner needs rather than any imposed plots. The police work is brutal and not very intricate. The speed of Bruen's writing is a virtue in this series, reinforcing rather than undercutting the focus on character rather than events and (given the ensemble character of the series) not dwelling too much on the self-loathing that some of these characters possess in almost as large a dose as Jack Taylor. But unlike Taylor, these characters may be struck down again and again, but they keep on going, like Beckett's characters, with resignation and humor rather than succumbing totally to the drugs and booze that they do, indeed, imbibe.